New AZ-302 Microsoft Azure Solutions Architect Certification Transition has been released. As we all know that 70-535 exam has been retired. If you have taken 70-535 exam and want to get Azure Solutions Architect Expert certification, you will be required to answer AZ-302 exam successfully. Valid Microsoft Azure AZ-302 exam dumps will help you pass Microsoft AZ-302 exam. 1. This is a case study. Case studies are not timed separately. You can use as much exam time as you would like to complete each case. However, there may be additional case studies and sections on this exam. You must manage your time to ensure that you are able to complete all questions included on this exam in the time provided. To answer the questions included in a case study, you will need to reference information that is provided in the case study, Case studies might contain exhibits and other resources that provide more information about the scenario that is described in the case study. Each question is independent of the other questions in this case study. At the end of this case study, a review screen will appear. This screen allows you to review your answers and to make changes before you move to the next section of the exam. After you begin a new section, you cannot return to this section. To display the first question in this case study, click the Next button. Use the buttons in the left pane to explore the content of the case study before you answer the questions. Clicking these buttons displays information such as business requirements, existing environment, and problem statements. If the case study has an All Information tab, note that the information displayed is identical to the information displayed on the subsequent tabs. When you are ready to answer a question, click the Question button to return to the question. You develop and deploy a stateful ASP. NET Core 2.1 web application named Policy service to an Azure App Service Web App. 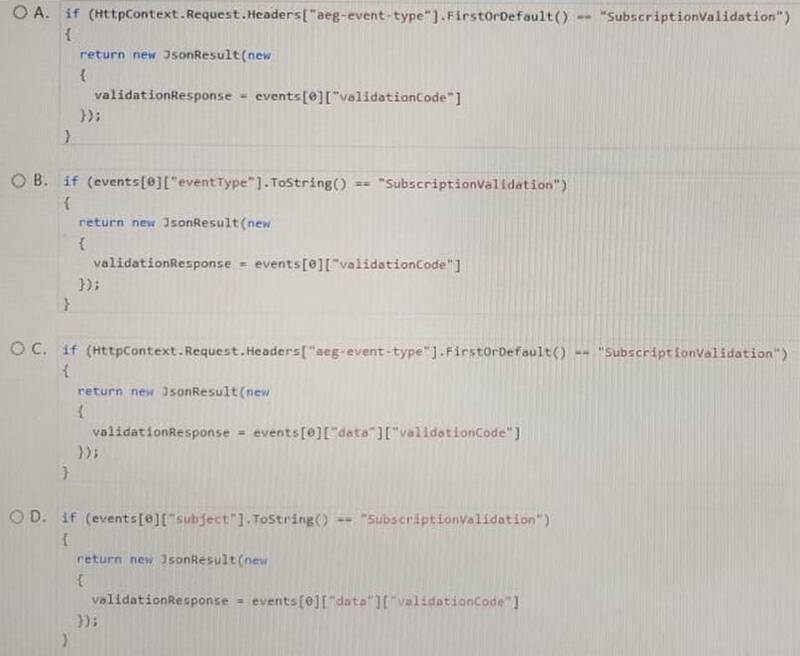 The application reacts to events from Azure Event Grid and performs policy actions based on those events. All Azure App Service Web Apps must write logs to Azure Blob storage. All log files should be saved to a container named logdrop Logs must remain in the container for 15 days. You have a shared library named PolicyLib that contains functionality common to all ASP. NET Core web services and applications. – Provide methods that allow a web service to scale itself. If an anomaly is detected, an Azure Function that emails administrators is called by using an HTTP Web Hook. All web applications and services have health monitoring at the/health service endpoint. 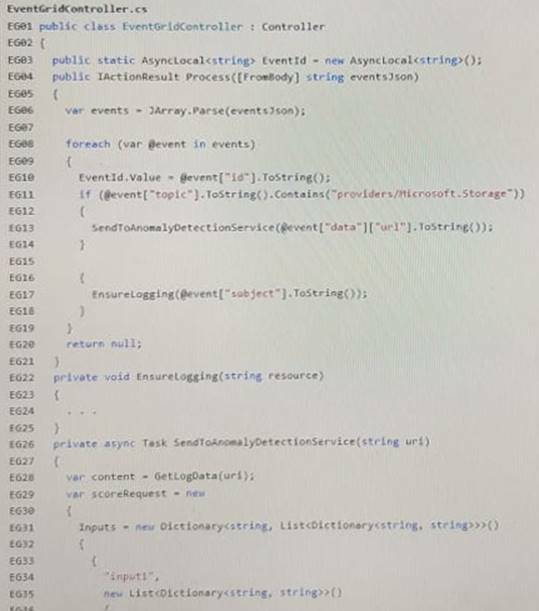 Relevant portions of the app files are shown below. Line numbers are included for reference only and include a two-character prefix that denotes the specific tile to which they belong. 2. You need to ensure that the Policy service can implement the policy actions. 3. You need to ensure that the solution can meet the scaling requirements for Policy Service. 4. 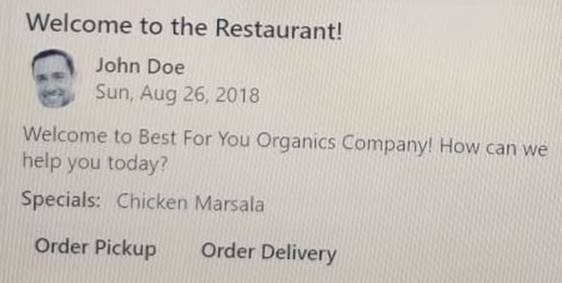 Best for You Organics Company is a global restaurant franchise that has multiple locations The company wants to enhance user experiences and vendor integrations. The company plans to implement automated mobile ordering and delivery services. Best For You Organics hosts an Azure web app at the https://www.bestforyouorganicscom. Users can use the web app to browse restaurant locations, menu items, nutritional. information, and company information. The company developed and deployed a cross-platform mobile app. You must develop a chatbot by using the Bot Builder SDK Intelligence Service (‘LUIS). The chatbot must allow users to order food for Pickup or den-very. – Use natural language processing and speech recognition So that users can with the chatbot by using text and voice. Processing mast be server-based. – Alert users about promotions at local restaurants. – Enable users to an Older for delivery Pickup by using their voice. – Greet the user upon sign-in by displaying a graphical Interface that contains action buttons. Vendors receive and provide updates for the restaurant inventory and delivery services by using Azure API Management hosted APE. Each vendor uses their own subscription to access each of the APIs. – API usage must not exceed 5,000 calls and 50,000 kilobytes of bandwidth per hour per vendor. – It a vendor ‘s nearing the number of calls or bandwidth limit the API must trigger email nonfictions to the vendor. 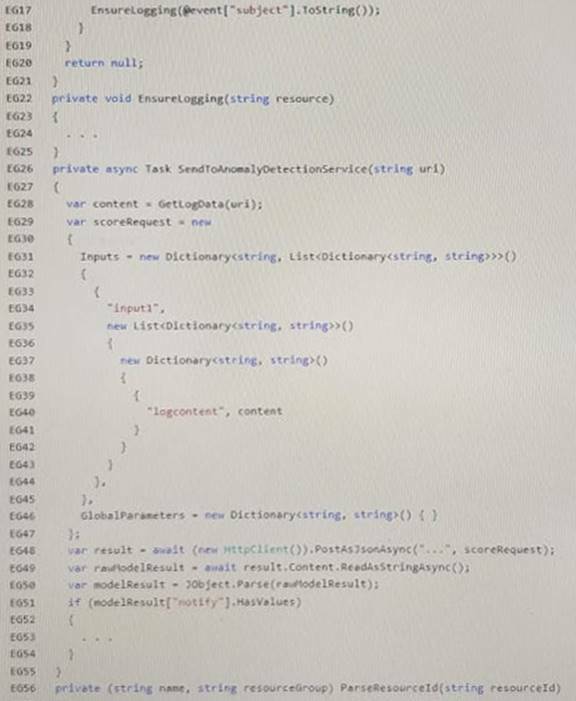 – The Inventory API must be written by using ASP.NET Core and Node.js. – The API must be updated to provide an interface to Azure SQL Database. 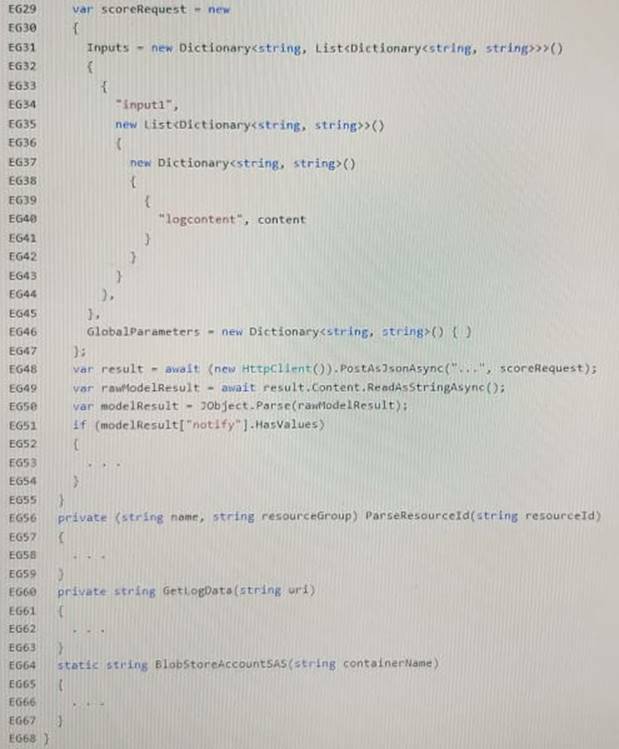 Database objects must be managed by using code. – The Delivery API must be protected by using the OAuth 2.0 protocol with Azure AL-five Directory (Azure AD) when called from the Azure web app. You the Delivery API and web app in AD. You enable OAuth 2.0 in the web app. – The deliver/ API must update the Products table, the Vendor transactions table, and the Billing table in single transaction. The chatbot’s greeting does not show the user’s name. You need to debug the chatbot locally. In this section, you will see one or more sets of questions with the same scenario and problem. Each question presents a unique solution to the problem, and you must determine whether the solution meets the stated goals. More than one solution might solve the problem. it is also possible that none of the solutions solve the problem. 6. Note: This question is part of a series of questions that present the same scenario. Each question in the series contains a unique solution. Determine whether the solution meets the stated goals. 7. Note: This question is part of a series of questions that present the same scenario. Each question in the series contains a unique solution. Determine whether the solution meets the stated goals. 9. You need to resolve the language processing issue. 10. You need to meet the security requirements. 11. Note: This question is part of a series of questions that present the same scenario. Each question in the series contains a unique solution that might meet the stated goals. Some question sets might have more than one correct solution. while Others might not have a correct solution. After answer a question in this section will NOT be able to return to it. As a result, these questions will not appear in the review screen. You need to deploy resources to host a stateless web app in an Azure subscription. – Provide access to the fill .NET framework. – Provide redundancy if an Azure region fails. 12. Note: This question is part of a series of questions that present the same scenario. Each question in the series contains a unique solution that might meet the stated goals. Some question sets might have more than one correct solution. while others might not have a correct solution. 13. Note: This question is part of a series of questions that present the same scenario. Each question in the series contains a unique solution that might meet the stated goals. Some question sets might have more than one Correct solution. while others might not have a correct solution. Solution: You deploy an Azure virtual machine to two Azure regions, and you deploy an Azure Application Gateway. 14. Note: This question is part of a series of questions that present the same scenario. Each question in the series contains a unique solution that might meet the stated goals. Some question sets might have more than one correct solution. while others might not have a correct solution. 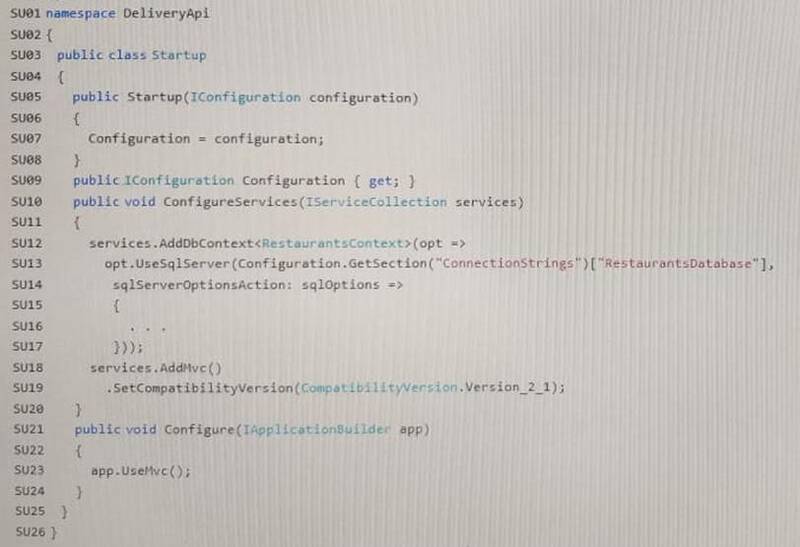 You use ASP,NET Core MVC with ADO.NET to develop an application. You implement database shardinq for the application by using Azure SQL Database. You establish communication links between the shard databases. – Create stored procedures in each Azure SQL Database instance to perform operations for each respective database. – Invoke a named transaction and use the same name for the transaction in each stored procedure. 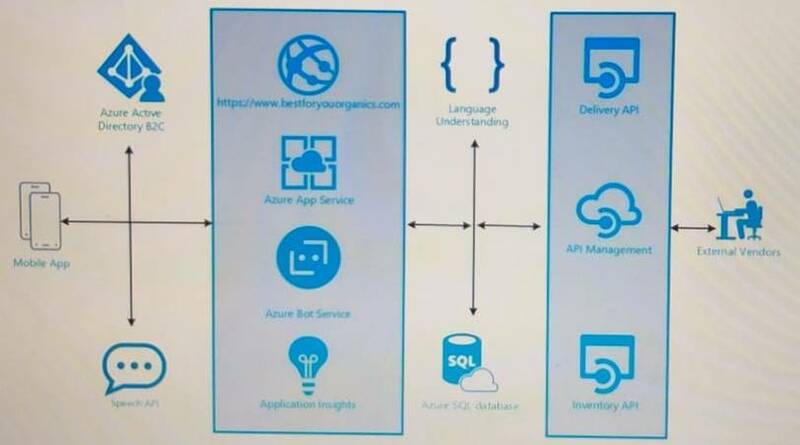 – Establish a new transaction scope in a using block Within the block, establish connections to each Azure SQL Database instance and run the stored procedure. – It no exception occurs, commit the scoped transaction. 15. 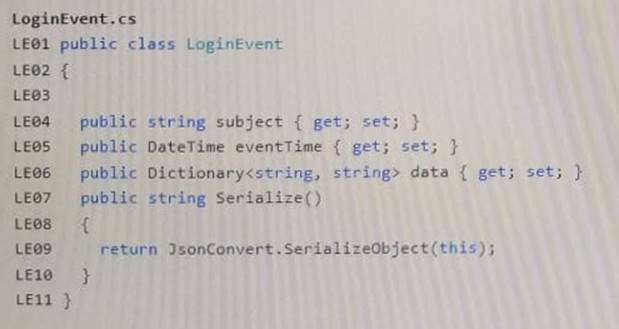 You create an Azure Time Series Insights event handler. Thanks for your message. The exam cost $68, however, at DumpsBase, you can enjoy 28% discount. Finally, you can get this real dumps at the price of $41.76.